If I'm not going to see bands in Wisconsin, I'm watching the Green Bay Packers. Well, it's over. The Packers blew it big time last Sunday night and I'm back to live music 24/7. It was fun to go to a show on Saturday night and wake up just in time to see the Packers crush someone. Again, that day has passed. 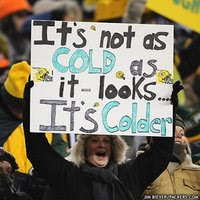 I look forward to the fall for two reasons: The great weather, and The Green Bay Packers.